b. Sight Setting and Laying Exercises. 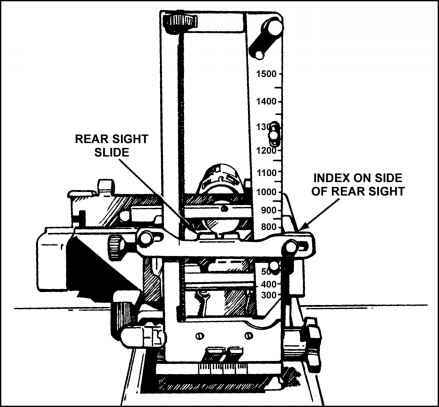 This first exercise teaches the soldier how to set the rear sight quickly and correctly (Figure 4-10). The second builds accuracy and speed in laying the gun on an aiming point, and allows extra practice in sight setting. Explain and show each exercise before beginning instruction. • Set the sight at the announced range. • Assume the correct gunner's position. The soldier, acting as coach, checks the setting of the slide and points out any errors. The soldiers work in pairs, change roles, and go through the exercise until each one can correctly and rapidly set the sight. Figure 4-10. Rear sight adjustments. • Manipulate the gun by turning the T&E handwheels until sights are aligned on the chosen aiming point. The soldier, acting as coach, checks the sight setting and lay of the gun. The soldiers work in pairs, changing roles until each is skilled in doing the exercise. c. Manipulation Exercise. Manipulation means shifting the direction of the gun from one point to another. There are two manipulation exercises. (1) The first exercise gives the gunner practice in manipulation. The coach stands 10 paces in front of the gun and uses hand signals to show the direction in which the gunner is to move the muzzle (Figure 4-11). The gunner works the handwheel to manipulate the gun. The coach observes and makes needed corrections. 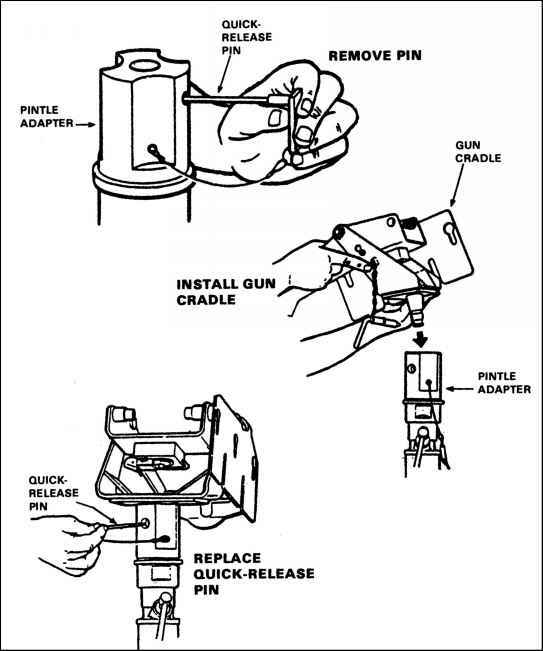 When the gunner reacts quickly and can manipulate the gun as he has been shown, his instruction may continue. Figure 4-11. Coach and gunner exercise. NOTE: Continue this exercise until the gunner is skilled in sighting and aiming. (a) Place the MK 19 target board 10 meters from the muzzle of the gun. (b) Make large shifts in direction by releasing the traversing slide lock lever and moving the slide to the right or left. Make small changes in direction by turning the traversing handwheel with the left hand. One click on either T&E handwheel moves the strike 1 mil (1 cm on the target). 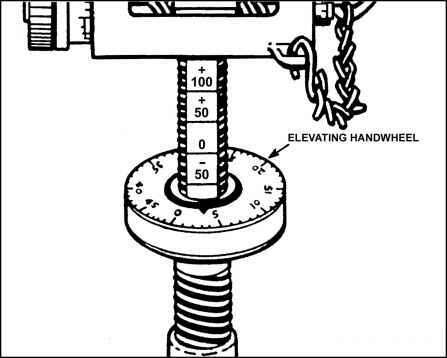 (c) Manipulate for elevation by rotating the elevating handwheel with the left hand (Figure 4-12). d. Range Determination Exercise. Range determination means finding the distance between the gunner's position and his target. The gunner's ability to engage a target depends on his ability to correctly find the range to the target. Under combat conditions, ranges may not be known in advance; the effectiveness of fire depends largely on the accuracy of the range used. There are several methods for finding range. Some of these methods include: estimating visually, firing the weapon, measuring range from a map or aerial photograph, and pacing the distance. Binoculars or laser range finders may be used (see Chapter 5, Techniques of Fire, for more on range determination). e. Range Card Exercise. A range card is a record of the firing data needed to engage predetermined targets within a sector of fire at night or during degraded conditions. The range card may also be used to aid in target engagement during good visibility. It aids the leader in preparing his defense plan. Predetermined targets in the secondary sector are engaged by use of field expedients. A range card has two parts: a sketch section and a data section. Although the sketch is not drawn to scale, the data referring to the targets must be correct. DA Form 5517-R is the standard range card to be used (Figure 4-13). Figure 4-13. Range card sketch (1) and data sections (2). (1) Range cards are prepared for primary, alternate, and supplementary positions. They are prepared immediately upon arrival in a position, regardless of the length of stay, and are updated as necessary. Range cards are prepared in duplicate. One copy stays at the gun position, and the other is sent to headquarters. Range cards are prepared on arrival in a position, regardless of the planned length of stay. Range cards are revised often during occupation of a position. 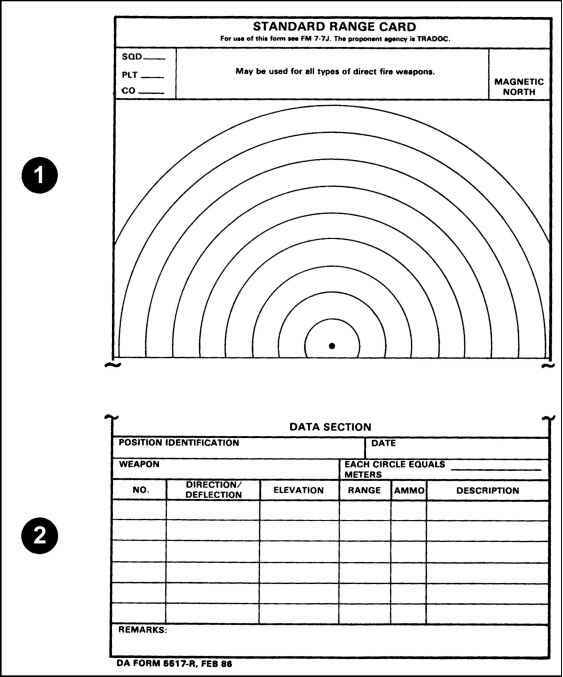 (2) Once the leader has decided where the firing position will be, the gunner prepares the range card. (a) Draw a sector sketch, covering the entire sector. Make the sketch as large as possible, not to exceed the largest circle. 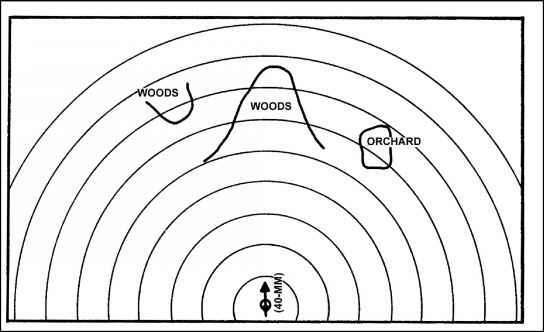 For a large area covered by trees or woods, draw only the outline and label the area "woods" or "orchard" (Figure 4-14). Figure 4-14. 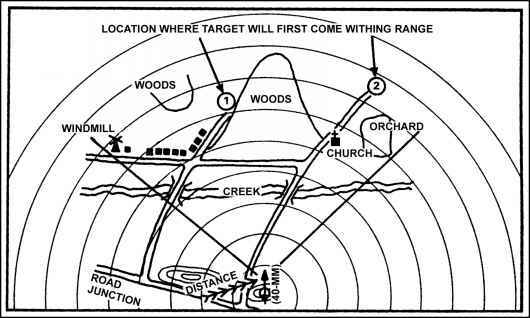 Sketch of area on range card. (b) In the lower center of the sketch section, show the firing position by drawing the symbol for the weapon (Figure 4-15). Figure 4-15. MK 19 symbol on range card. 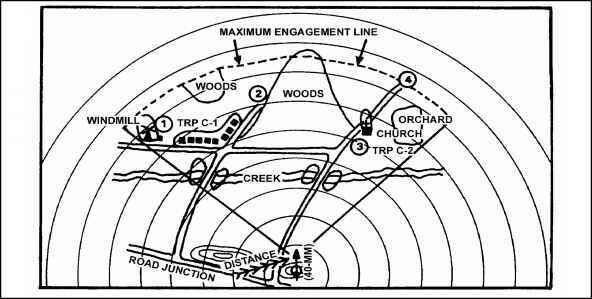 (c) Show the location of the firing position by drawing a sketch of a nearby recognizable terrain feature. Label it and draw an arrow to the weapon symbol. Add the distance and azimuth from the terrain feature to the firing position (Figure 4-16). Figure 4-16. 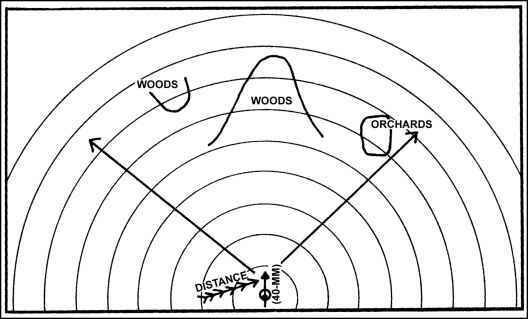 Distance and azimuth to terrain feature. (d) Draw lines from the weapon symbol to reflect the left and right limits (Figure 4-17). Figure 4-17. Sector of fire. 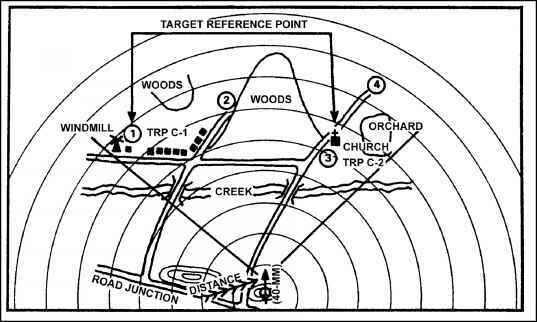 (e) Number the planned target engagement locations from left to right, and write them on the range card (Figure 4-18). Figure 4-18. 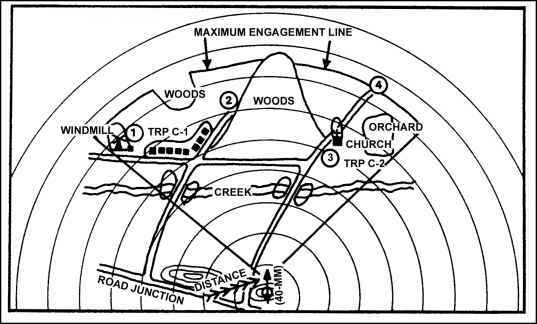 Planned target engagement areas. (f) Number the target reference points (TRPs) and write them on the range card (Figure 4-19). Figure 4-19. 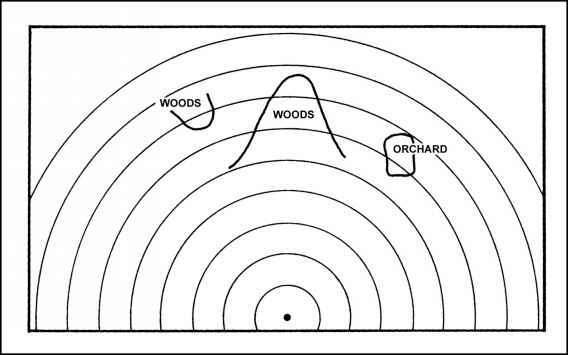 Target reference points. (g) If no limiting factors exist, the maximum engagement line curves and joins the left and right sector-of-fire boundaries at the maximum engagement range (Figure 4-20). If limiting factors exist, draw the maximum engagement line in front of the limiting terrain features (Figure 4-21). Figure 4-20. Maximum engagement line. Figure 4-21. Limiting factors on maximum engagement line. For use of this form see FM 7-7J. The proponent agency is TRADOC. May be used for all types of direct fire weapons. How measure distance on a mk 19?